Be prepared for burning thighs and calves as this hiking trail will challenge your physical limits with over 1,000 stairs. The trail begins at Wong Nai Chung Reservoir Park just before Parkview, indicated by a sign board that reads ‘Stanley Section’. Keep in mind that Violet Hill is not the first hill of 'The Twins'—it’s a teaser for the more intense hike to follow. At the end of Violet Hill there is a junction where a long flight of steps awaits, signifying the beginning of The Twins. It is a tough 30-45 minutes before reaching the top of the first hill, but you'll be rewarded with sweeping views of Stanley and Tai Tam Bay as you begin to descend for the next peak of The Twins, which is slightly less challenging. Towards the end of the trail, simply follow the concrete staircase that leads down to Stanley Gap Road. The best time to start is early in the morning, so you’re just in time for brunch at The American Club in Stanley at the end of the hike. High Junk Peak is a moderate hike that offers unobstructed views of Clear Water Bay and Tseung Kwan O. The first section consists of a fairly easy path uphill, which leads to a fork with a sign pointing right to Clear Water Bay Road and another one pointing left to Tai Miu—stick to the Tai Miu direction throughout the trail. 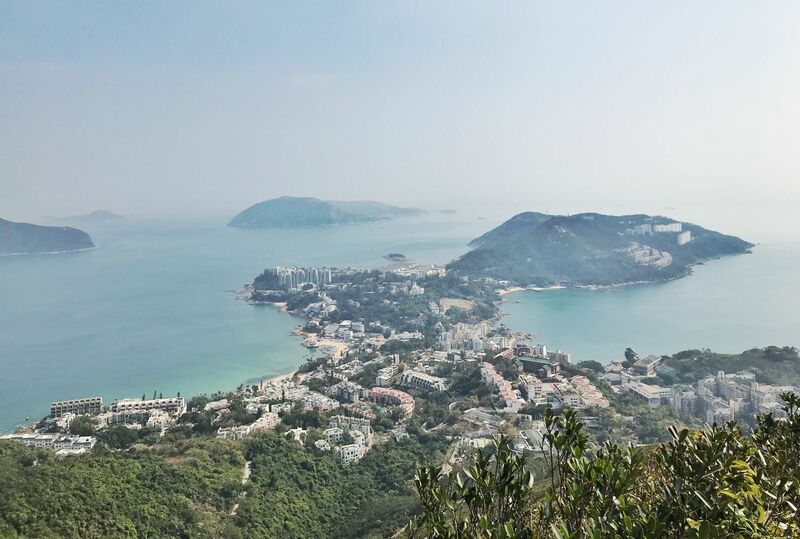 From there, you'll encounter gentle ascends before reaching the hilltop, a great spot to enjoy the panoramic views of Sheung Sze Wan and get ready for the sharp summit of High Junk Peak in front of you. Follow the path downhill towards Tin Ha Shan, and as you continue along the trail, the sack-shaped bay of Po Toi O and The Clearwater Bay Golf and Country Club will come into sight. Then it's time for a well-deserved glass of bubbly at the club. Also known as Hong Kong Trail Section Four, Lady Clementi's Ride is a relaxing hike to take from Wan Chai Gap Road to Aberdeen Reservoir. The trek starts with a short walk along Mount Cameron Road towards Aberdeen Country Park, which joins the path to Middle Gap Road. It’s a pleasant, shaded woodside trail that crosses several old English bridges and small streams. Keep going on the path and you’ll see exhilarating vistas of Wong Chuk Hang and beyond—something different from the usual Hong Kong landscape. From here, follow the winding, uphill road to Black's Link with little shade for around 15 minutes, which ends at the junction of Wong Nai Chung Gap Road. A rewarding hike that passes through a shaded forest and paths surrounded by lush greenery, Ma On Shan Country Trail feels completely remote from urban areas. Setting off from the Ma On Shan Country Park barbecue site, you’ll first pass by an abandoned village then follow the trek to MacLehose Trail Section Four, which will soon reveal the incredibly scenic Ngong Ping plateau, featuring a plain grassy slope with open vistas overlooking rolling ranges of Ma On Shan and Tiu Shau Ngam. Continue down in the direction of Sai Kung, and the final leg is a short flight of steps that will take you to Tai Shui Tseng near Sai Kung. A fascinating hike that combines history and nature, Wong Nai Chung Gap Trail is Hong Kong’s first battlefield trail where you can find Hong Kong’s wartime remnants left from the Japanese invasion during World War II. Throughout the trail, there are photos and information boards that give insights on the short but intense historical event and the significant role Wong Nai Chung Gap played at that time. Most of the paths are paved and shaded, and as you continue the trail downwards you’ll reach Jardine’s Lookout, which boasts a splendid panorama spanning from Central and East of Hong Kong Island to the peninsula of Kowloon. Further downhill, the path connects to the Wong Nai Chung Tree Walk which eventually leads to Happy Valley.